These happily are not numerous in the horse. The chief offenders are the "distomes" or flukes, and the "cestodes" or bladder-worms. Of the former the Distoma hepaticum, fig. 112, is the particular species which infests the liver of the horse. 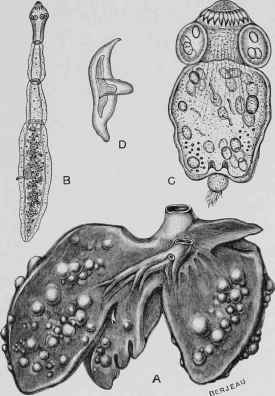 Of the latter the Echinococcus veterinorum, fig. 113, the cystic or bladder phase of development of the Taenia echinococcus of the dog, is the principal, if not the only hydatid parasite infesting the liver of this animal. The Distoma hepaticum in its embryonic condition gains access to the body by means of food and water, and, having reached the small bowels, enters the liver by way of the biliary duct. Here it takes up its abode, and in the course of its growth and development excites irritation in the bile-ducts, leading to thickening and disorganization of their walls, blocking up of the biliary channels, and interruption to the proper discharge of the bile into the alimentary canal. When the parasites exist in considerable numbers the structural changes extend beyond the ducts into the parts around, where an active growth of connective tissue is induced. As a consequence of this the blood-vessels are compressed, the circulation is interfered with, the glandular tissue suffers impairment of nutrition, and its destruction sooner or later follows. Should this destructive process continue, the function of the liver becomes impaired, and the supply of bile for the purpose of digestion is both insufficient in quantity and indifferent in quality. Fig. 112. - Common Liver Fluke (Distoma hepaticum). A, Showing anatomical details. B, Natural size, c, Ciliated embryo or young distome. In these circumstances the general health gives way, there is loss of strength, swelling of the legs, an unthrifty appearance, and gradual wasting of the body. These symptoms offer no evidence of the seat and nature of the disease, and it may be that reliable indications of the organ affected will not appear until the last stages of the malady have been reached. The bowels now become irregular, the faeces pale in colour and offensive in odour, the membranes lining the eyelids and the nose assume a yellow appearance, and the urine is similarly discoloured. The difficulty of diagnosing the existence of parasites in the liver is in some measure a disadvantage, but experience has amply shown that nothing can with safety be given to our patient that will dislodge these distomes from their stronghold. In view of this fact, the great object of treatment should be to uphold the animal's strength by the administration of vegetable and mineral tonics in a plentiful supply of good nutritious food. A small quantity of common salt may also, be given daily, and with these measures good nursing and healthy surroundings should be enjoined. If the damage inflicted on the liver is not great, the parasites will in the ordinary course quit the organ, and a return to health may be anticipated. Echinococcosis of the liver, as it is termed, is the result of the invasion of that organ by the embryo of a tape-worm (Taenia echinococcus) which infests the intestines of the dog. As in the case of the distomes just noticed, the mode by which the parasites gain access to the body is through the medium of food and water. The dog having discharged with his excrement the segments of the tape - worm, charged with eggs, the latter will sooner or later be set free and become accessible to horses and other animals in their food or water. Deposited on pasture land the ova of the parasite would be taken up in grazing, and, having reached the intestine of the equine host, would then hatch out. Fig. 113. - Liver infested with Echinococcus. a, Liver studded with echinococcus cysts. B, Taenia echinococcus, tape-worm of the dog. c, Embryo or young taenia. D, Hooklet. It is believed that at this point the embryo enters the liver by way of the biliary duct, and, having taken up its position in the structure of the gland, proceeds to develop a cyst (fig. 113), or, as it is sometimes called, a bladder-worm. After a period of five months it is said to reach the size of a walnut, and may still continue to increase until it becomes as large as an orange. Water forms the chief contents of the cysts, but from the internal surface new broods of embryo tape-worms are being formed which, should they escape and reach the intestines of the dog, will there mature into the tape-worm Tarda echinococcus, from the eggs of which the cysts were originally derived. One or two, or even more, of these bladder-worms may exist in the substance of the liver without in any way upsetting the balance of health, but where large numbers crowd the organ and forcibly compress the blood-vessels, much of the gland structure is broken up and its functions correspondingly impaired. In the former case the hydatids perish, and become resolved into small pasty or mortar-like masses. In the latter they enfeeble and slowly destroy their host, when many of those which survive, if consumed by the dog, will develop into tape-worms. The symptoms occasioned by these parasites are such as are met with when the liver becomes infested with flukes, and seldom afford any clue to the precise cause of the disease. For a long time they may but faintly indicate the organ attacked. The measures of treatment therefore recommended in the one case may also be followed in the other.